Forget your keys or your cell phone? Misplaced your wallet or your purse? Say something obnoxious or rude and then wonder how that ever came out of your mouth? No, it’s not Alzheimer’s setting in. It’s not a senior moment. You can relax and stop worrying about either of these. Most likely, you, like many in this fast-paced culture, are suffering from – mindlessness. Mindlessness is when our thoughts run amuck, kind of like monkeys in a cage. They jump from here to there willy nilly. I know my mind is constantly processing. I’ve often been told “You think too much” and maybe so having worked in an analytical career for over 30 years. My job was all about problem solving and finding links and root causes. Plus the added pressure of being a single mom and having to manage everything myself, my mind was on overdrive for years. Most of the time we operate out of routine and schedules like we are on auto-pilot. We are so used to moving fast in an endless struggle to accomplish more and more, we plan our days to the max, and then as our head hits the pillow at night we often wonder where did the day go? Did I enjoy it? Was I really present? Did I make choices that are in line with my values? Was I kind? If the answer to these questions is no, today I am going to share a technique to help us all with this unproductive and often stress-filled way of living. It’s called mindfulness meditation. Now for those who may be new to this technique, there are many different kinds of meditation. 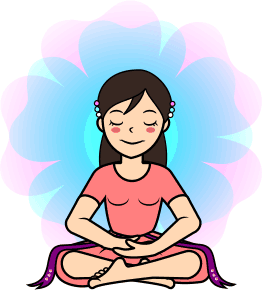 This post is going to focus on what is called mindfulness meditation. In other words, we will be discussing a method on how to train our minds to be more attentive to the present moment. It is a skill that will serve us well in many areas of our lives and you can learn it right in the comfort of your home. You don’t need any special tools or equipment. All you need to start is 15 minutes a day by yourself. That’s it. You can carve out 15 minutes a day to live a life more fully engaged, right? But first, let’s address the common concern many people have about meditation. It seems meditation has gotten a bad rap, especially among Christians, who balk at the very idea. Some disdain or dismiss it, thinking it is ungodly or against their religious beliefs. I would like to put your fears at rest. There are many verses of Scripture that encourage us to manage our thought life. One of them is 2 Cor 10:5 which exhorts us to “Take every thought captive”. Colossians 3:2 says “Set your mind on things above, not on earthly things,”. The Apostle Paul knew the value of managing our thoughts and not allowing them to manage us. We are also encouraged to “Be still and know that I am God”. When we manage to sit ourselves down and clear our minds for a few minutes, we release stress and tension and we are able to sift through the cacophony of inner voices that chatter to us during the course of the day. Calming the mind is not the only benefit of meditation. – Increases blood flow and slows the heart rate. – Increases exercise tolerance in heart patients. – Promotes a deeper level of relaxation. – Reduces anxiety attacks by lowering the levels of blood lactate. – Decreases muscle tension (any pain due to tension) and headaches. – Enhances the immune system. Research has revealed that meditation increases activity of ‘natural-killer cells’, which kill bacteria and cancer cells. There are tons of books and now websites that offer to teach us how to meditate. Some of them can be unnecessarily complicated and confusing. Websites usually involve a fee at some point. Today I am going to share an introduction and some simple steps to begin your meditation practice. Yes, meditation is a practice. It is a spiritual discipline just like reading your favorite sacred text or praying daily. Think of it as sending your mind to the gym. Just as we train our physical bodies to perform at their optimum level, so our minds need to be trained to perform well. We are constantly barraged by external sensory input: cell phones, noises, traffic, music, texting and talking. No wonder we have trouble hearing from God with so much input coming at us all the time. Just like defragging the memory on our laptops, it is important to clear out the mental clutter and basically do a reboot on our minds. So here are some simple steps to help you get started. 1. Find a time of day or night, preferably both, where you can get quiet for 10 – 30 minutes. Make sure the cell phones are off and tell the family you are taking a quiet time break. Encourage them to take one as well. 2. Make sure your clothing is loose and comfortable and the room temperature is appropriate. We want to eliminate anything that could distract us from our task. 3. Sit in a comfortable position either in a chair or on the carpet. Use a cushion, pillow, or a folded blanket if you like more support. Make sure you sit up straight with an erect spine. I like to sit in half-lotus which is cross legs with one foot on top of the other knee. 4. Close your eyes and rest your hands either in your lap or on your knees palms up. 5. Begin to focus on your breathing. Start breathing through your lower belly rather than your chest. As you settle, your breathing will get slower and fuller. You may put one hand on your belly to make sure it is rising and falling with each breath until you get the hang of deep breathing. 6. Scan your body and relax and release any tension or tightness in your muscles. Relax your shoulders, your face, your hips, etc. 7. Once you have completed the body scan, continue to focus on your breath. The breath becomes a focal point of your practice. Observe the air coming in and out through your nostrils. Observe the length of your breaths. Keep your mind focused on your breathing. You will notice many thoughts come into your mind. This is natural at first. Notice the thoughts and let them float by like clouds. As your breathing slows down, so will your thoughts. Continue to bring your attention back to your breath each time it wanders. 8. Resist the urge to keep checking the clock. If you’d like, set an alarm. The longer you can sit the more relaxed and focused you will become. You will feel refreshed, relaxed, and energized to go about the rest of your day. Meditation is also a great practice to do at night before bedtime. It quiets the mind and prepares it for a restful night’s sleep. As you can see, beginning a meditation practice is not all that difficult. The benefits you will receive are well worth the time you put into it. Like anything else, implementing a regular meditation time means decluttering your life to make room for what is truly valuable and useful. Turn the television off sooner and use that time to meditate. Hope you enjoyed this post. Love to hear if you try my tips and how they work for you. Until next time, keep looking up! Next Article Has Easter Lost Its Meaning?